Where are HARi&CO’s products manufactured? Where do the beans used in HARi&CO’s products come from? Where do the other ingredients used in HARi&CO’s ingredients come from? Are all the ingredients used in HARi&CO’s products organic? Do HARi&CO’s products contain soy and why? 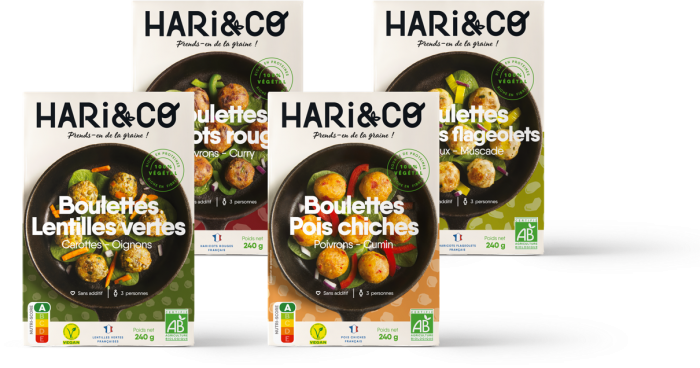 Does HARi&CO produce mock-meat products? How do I preserve the products once I have purchased them? Why are your products frozen? What is your product composition? Could you tell me more about the Nutriscore labeling on HARi&CO’s products? How should I cook your products? 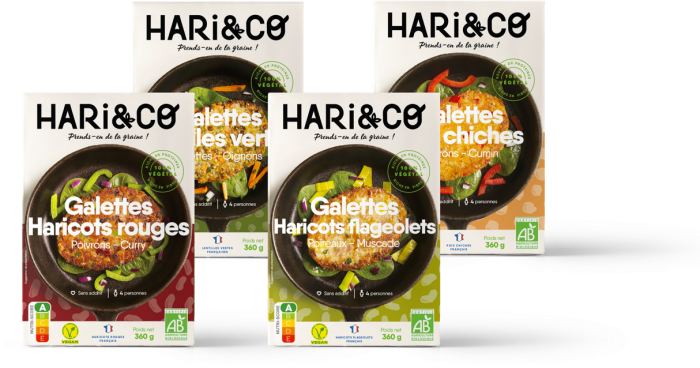 What side dish should I serve with the HARi&CO’s products? How much protein do your products contain? How many calories do your products contain? Are you also a restaurant or mass catering supplier? How can I better digest beans? Which beans are the most protein-rich? Which beans are the most fibre-rich? What are some sources of plant protein? How is your approach linked to sustainable development? How do I repace meat? Can I eat your products as a daily meat replacement? Our products are manufactured by our industrial partner in the “Drôme Provençale,” found in the heart of Provence. Furthermore, no raw materials of animal origin come into contact with our products in the manufacturing process. Our beans are grown in France. We have established partnerships with three farming cooperatives: in the Auvergne Rhône-Alpes region, in the Greater Southwest, and in the Greater West of France. We have settled on a contracting scheme featuring agricultural partnerships in order to secure the volume and availability of raw materials and to promote the development of the French legume and organic food sectors. The beans (which make up 50% of the ingredients found in our burgers and no-meat balls) are grown exclusively in France. We obtain our vegetables and seasonings from France and from neighbouring European countries. All the ingredients used in our recipes are organic, with the exception of salt and water, which can never be considered organic to begin with! Our products are not gluten-free. We use cornmeal, wheat semolina, as well as wheat flakes and wheat flour to grant our products a nice texture. Combined with beans, the grains added to our recipes also provide you with all the essential amino acids (which make up proteins) your body needs. This combination leads to a greater degree of protein absorption than would be possible if they were consumed separately. (Source: INRA, A return to favour of plant proteins). The majority of plant-based meat alternatives on the market today are soy-based, which is a rather bland and uninspiring legume for the European consumer. We want to offer a product featuring beans from our own French culinary heritage, such as the green lentil, the flageolet bean, and the chickpea. Above all, we are set on offering you the possibility to know what you eat. This implies seeing the ingredients in the products that you consume and being able to visibly distinguish the beans and vegetables used. With that being said, HARi&CO does not produce mock-meat products that imitate the texture, the appearance, or the taste of meat. These meat imitation products require the addition of textured protein substances or additives such as meat flavourings or texturising agents such as guar and xanthane gum. Does that sound appetizing to you?! It sure doesn’t tempt us! HARi&CO burgers and no-meat balls are frozen goods and they must be stored in your freezer at temperatures below -18°C. Make sure they do not defrost during transportation, and if this does happen, they must be consumed at once, not refrozen. Our products are additive and conservative-free. We freeze them to ensure their conservation without having to resort to high-temperature heat treatments that would alter their appearance and flavour. Every one of our recipes features a bean (lentil, chickpea, flageolet bean, etc.) combined with grains (semolina, corn, wheat). We add some vegetables (carrots, leeks, onions, etc.) and spices (cumin, Provencal herbs, etc.). In short, nothing but good stuff! Find out more here! Nutriscore is a logo that provides a information about the nutritional quality of a product in simplified form. It is based on a grading scale ranging from letters A (highest score) to E (lowest score) according to the nutritional profile of the product. The score is calculated per 100 grams of the nutrient content of healthy food (fibres, proteins, fruit, and vegetables) and the nutrient content of unhealthy food (calories, saturated fats, sugar, salt). The total score attributed to a product is then associated with a letter. All HARi&CO’s products have obtained the letter A. Our products are easy to prepare! You can toss them in a pan (8 min) pop them in the oven (10 min) or even plunge them in a deep fryer (2-3 min). All you have to do is turn them over midway through cooking and you’ll be good to go! Our burger and no-meat ball products make up the basis of a meal by replacing meat, fish, eggs, etc. You can opt for several side dishes and play around with the recipes. For instance, our burgers are taste great stuffed between two hamburger buns and our no-meat balls are the utlimate garnish to your salads. Visit our blog for more recipe ideas! 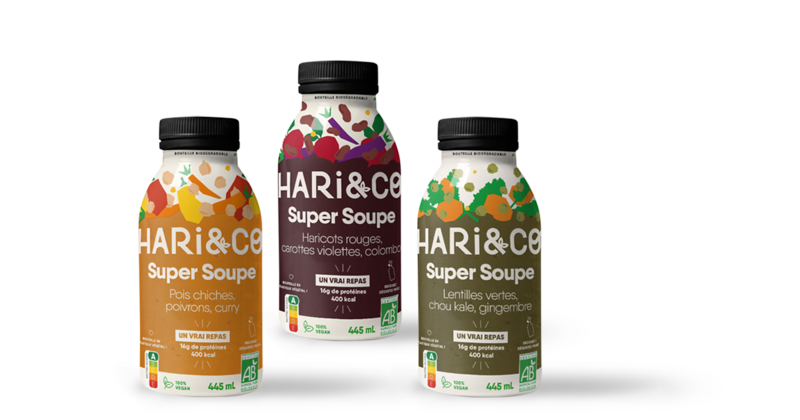 HARi&CO’s products are the base of a meal, meaning that they replace meat, fish, or eggs in any given meal. Therefore, they can be served with the same side dishes. You could whip up a vegetable hash or ratatouille on the side, or even add some carbs in the form of rice or pasta. For more recipe ideas, be sure to check out our Instagram account for all of our recipe tips! > Green lentils: 9.5 g per 100 g.
> Chickpeas: 7.6 g per 100 g.
> Flageolet beans: 8.4 g per 100 g.
> Red beans: 8.4 g per 100 g.
> Green lentils: 164.9 kcal per 100 g.
> Chickpeas: 165.6 kcal per 100 g.
> Flageolet beans: 166.9 kcal per 100 g.
> Red beans: 158.5 kcal per 100 g.
Our products are distributed in the out-of-home catering sector, meaning in school and company canteens. We also supply food chains such as Ninkasi, Burger and wells, and the Zinc à burger, all located in Lyon. Our products are also served at chez Mamie burger in Paris! 1. Let them soak in cold water overnight, drain the water they were soaked in, and rinse the beans several times. 2. Cook the beans well. While they are cooking, squeeze in some lemon juice for some aciditiy. 3. Finally, remember to chew veeeeeeeery carefully and to add spices (cumin, fennel, ginger…), which will aid in digestion and reduce chances of bloating :). Apart from soy, the most protein-rich beans in descending order are (/100 g): lentils (25.8 g), split peas (24.55 g), red beans (22.5 g), chickpeas (20.5 g), and flageolet beans (19.1 g). Apart from soy, the most fibre-rich beans in descending order are (/100 g): split peas (25.5 g), flageolet beans (23.4 g), lentils (17.1 g), red beans (15.2 g), and chickpeas (13.3 g). > They are naturally high in plant-based proteins. Together with grains, they can make up a proteinic contribution equivalent to meat. > They are high in fibre. A fibre-rich diet favours digestion and allows the body to better regulate its blood glucose levels. > They are rich in vitamins and minerals. beans are positively teeming with iron, magnesium, potassium, and vitamin B, all of which are essential for balance within the body. > They have a low glycemic index, which caters to a slower digestion process and greatly contributes to producing a feeling of satiety. > beans: rich in iron and fibre, they are naturally nutrient-rich. In this food category we come across: peas, beans, lentils, etc. > Grains (quinoa, corn, bulgur, rice, etc.) are also a good alternative to meat. Rich in carbohydrates and proteins, they contain many minerals. It is important to know that combining grains + beans provides all the amino acids your body needs. > Oilseeds: almonds, nuts, sesame seeds, etc. > On the one hand, developing a quality food supply source: beans have well-know nutritional benefits. They are rich in fibre and contain wulity plant-based proteins. Their combination with cereals (as we do in our recipes!) leads to an excellent absorption of plant proteins. They are a nutritional ally that establish a good dietary balance. > On the other hadn, developing sustainable farming practices by cultivating and transforming the way beans are perceived in France. Cultivating beans is a real agricultural and environmental boon! They are very water-efficient and do not require nitrogen-based fertilisers. They actually absorb the nitrogen present in the air and reintegrate it into the soil. As a result, by adding beans to a field of crops, we can reduce the overall consumption of nitrogen worldwide, and therefore reduce greenhouse gas emissions. THere are several existing alternatives to animal proteins, you just have to be aware of them. (Non exhaustive list). > beans are a primary source of plant protein: naturally rich in iron, fibre, and other nutrients. In this food category we come across: peas, beans, lentils, etc. > Grains (quinoa, corn, bulgur, rice, etc.) are also a good alternative to meat. Rich in carbohydrates and proteins, they contain many minerals. It is important to know that the combination of grains + beans supplies your body with all the amino acids necessary for its proper functioning. For what follows, the best thing to do is to give your culinary creativity free rein! For more recipe ideas, follow us on Instagram :). Our products are very good for your health but should be consumed as part of a balanced diet. We do not recommend you eat them everyday, simply because it is important to have a varied diet that includes different protein sources. Vegging up your meals can benefit both the environment and your health! > Meat production causes pollution: intensive livestock rearing is a huge source of greenhouse gases, deforestation, tremendous water waste, and soil pollution. To have sufficient yield, antibiotic use in animals is highly common. > An over-consumption of meat can also negatively impact your health: eating too much animal protein is unhealthy for your body. Excess protein, fat, and fatty acids promote bad cholesterol and certain cardiovascular diseases. Plant proteins exist (beans, grains, oilseeds, etc.) and supply you with the necessary protein intake to avoid any deficiencies. > Meat is expensive: poultry, beef, pork, lamb… consuming meat on a daily basis calls for a pretty hefty budget. To sum up: eating too much meat negatively impacts the planet, animals, and your own health: try to reduce your meat consupmtion a bit and to to focus on high-quality nutrition :). Flexitarianism is a dietary regime similar to vegetarianism. Also called a “flexible vegetarian,” a flexitarian reduces meat consumption without becoming exclusively vegetarian. Organic meat is favoured. Learn more in this highly informative article!